Boulevard of Broken Dreams | Life. Seriously? Funny! In the spring of 1942, a painter named Edward Hopper created a painting, which he entitled Nighthawks. It depicts a the counter waiter, dressed in a white uniform behind a triangular bar in a diner, a man in a suit and hat with his back to the observer, and a younger couple to the left of that man. The painting is a picture of lonely emptiness, which was exactly what Hopper was trying to capture. It was the mood of the country immediately following the attack on Pearl Harbor. 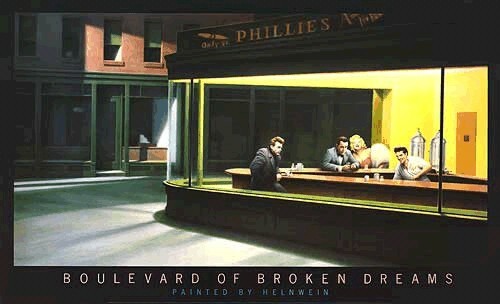 The most recent incarnation of this painting is Gottfried Helnwein’s Boulevard of Broken Dreams. In this painting, the characters of Hopper’s are replaced with Elvis Presley as the bartender, Marilyn Monroe and Humphrey Bogart as the couple, and James Dean, whose back is no longer toward the viewer but is turned and taking his characteristically “cool” stance while seated. Everyone in Helnwein’s work is striking a pose most recognizable for those stars, yet the message is the same: lonely emptiness. Now Helnwein is one seriously messed up mind. Yet even if you were to acknowledge this about him, he does possess a talent to communicate emotion in his works. The overwhelming conclusion you would get viewing any of his “art” is humanity lives in a world of violence, loneliness, emptiness and has no lasting meaning. In Boulevard of Broken Dreams he communicates they all died senseless deaths. Pressley died from complication due to extended use and abuse of alcohol and drugs; Marilyn died from an apparent drug overdose; Bogart’s death was attributed to alcohol abuse and James Dean died in a tragic auto accident. All were avoidable, all wasted life and talent, all were meaningless. The Apostle Paul speaks prophetically about our culture in his opening chapters of Romans. There Paul describes a culture rejecting God and His commands but instead has chosen to worship the creation of God rather than the God of creation. Paul writes in Romans 1 the unrighteousness of those who are enemies of God suppresses the very truth of God, the very thing offering them the life and meaning they seek. Since their activities are not right, or are unrighteous, they are unable to see the truth God has placed about Himself in all of creation. Paul’s conclusion is very unpleasant for those who refuse to come to God through submitting to what Jesus Christ has done for them: Paul writes, “As a result, they are without excuse.” Those who claim Christ and Christianity is nothing more than a recycled and repackaged psychological rational to “deal” with life, have made their choice. These people know God, they have seen His wonders in this world and in the lives of people, but they have refused to glorify “Him as God or show gratitude.” Paul’s thought continues: “Instead their thinking became nonsense . . . Claiming to be wise, they became fools and exchanged the glory of . . . God for . . . man, birds, four-footed animals and reptiles.” Today, we have chosen to substitute choice, materialism and the environment and therefore claim a greater sophistication over those silly ancients who worshipped the “idols” Paul describes. Yet all of this is merely a conclusion of what “is”—which is a description rather than a prescription. In John 10:10, Jesus is “painting a picture” for His listeners so they might understand the difference between what they could find on their own and what He is offering them. In this passage Jesus tells them He is the door through which everyone who enters can find salvation – in other words, completion, meaning and communion. He concludes, “I have come that they may have life and have it in abundance.” Jesus Christ promised to all of those who were seeking fulfillment and not finding it, the very thing they sought: real, lasting, fulfilling life with meaning and no loneliness! As a pastor, I find it extremely difficult to watch people fill their lives with everything but Jesus Christ. This is true of those who claim to know Christ as well as those who do not. Unfortunately, their dreams will not be broken in some late-night diner. Instead, their brokenness will be realized before the throne of Christ hearing the words, “Depart from Me.” It is also sad people often do not even know they are lost or on the wrong road. In all of our “going,” we do not realize we have made a wrong turn. For too many people, the awareness of going down the wrong road will not occur until we reach the end. Posted on December 29, 2011, in Uncategorized and tagged gottfried helnwein, humphrey bogart, loneliness emptiness. Bookmark the permalink. 4 Comments. I have only one issue with your writing. The original painting was not a bar but a diner. If you read the nptes written by Jo Hopper, she gives great detail in regards to this. Thos is also confirmed by the painter himself numerous times. The painting I am writing about is a diner. I’ll now have to correct the description of the waiter! I did say bartender. It is a no kidding diner! Thanks! This has been up a number of years. Your close reading is the first time this has been noticed! Bravo! I am deeply indebted to you!